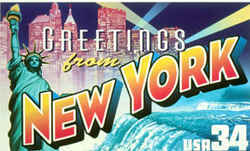 New York designated the bay scallop (Argopecten irradians) as official state shell in 1988. They live at the bottom of the sea and can swim by flapping their shells together. 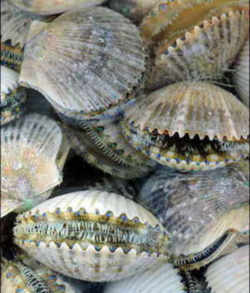 Adult bay scallops can grow to 3 Â½ inches (90 mm) and live in shallow coastal bays and estuaries. 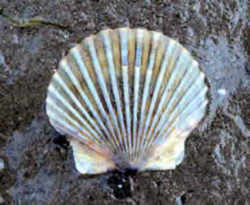 Bay scallop shells have 13 - 22 ribs stemming from the central point (umbo) of the shell. 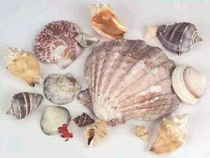 The color of the top shell (left valve) ranges from drab, dark grey to black or brown, with occasional yellow, orange, or red highlights. 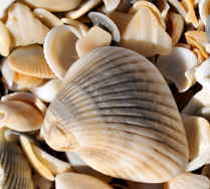 The bottom half of the shell (right valve) is usually lighter in color than the top, sometimes pale yellow or white. Bay scallop (Argopecten irradians) populations along the East Coast of United States once supported both commercial and recreational fisheries. Since the 1950's, many of the local populations have collapsed. Both natural and anthropogenic factors, including hurricanes, red tide events, loss of habitat and overfishing, can result in large fluctuations in bay scallop populations. Scallops are highly sensitive to changes in water quality; therefore, observing their health is a good way to measure the health of an ecosystem. A secretive animal that spends most of its short life hiding in underwater grasses, the bay scallop is a prized dinner entree for many and an important part of the marine ecosystem. Historically, the bay scallop was a valuable seafood commodity; however, declining populations have prompted restrictions, which now allow only recreational harvests. The bay scallop is a member of the shellfish family known as bivalves, named for its two valves, or shells. Its upper valve is a dark mottled color, occasionally bright yellow or orange, and its lower valve is typically white. Bay scallops may reach a shell height of two inches and live two years; although, in Florida their life span is generally only one year. The bay scallop feeds continuously by "vacuuming" or filtering small particles of algae and organic matter from the water. It does this by funneling water over open pathways called gills. One of these pathways takes in water and skims off particles, while another expels the filtered water along with digestive wastes. Scallops open their valves when feeding or breathing and close them when predators approach. The shell can also be slammed shut to avoid silt, which can clog the animal's delicate gills. Many tiny, blue eyes arrayed along the outer rim of the shell detect movement near the animal and serve as a warning system. When threatened, the scallop can swim backwards by clapping its valves and expelling water rapidly. A bay scallop has the remarkable ability to develop both male and female sexual organs; consequently, the scallop produces both eggs and sperm. Scallops release their sperm and eggs at different times to reduce the chance of inbreeding. The amount of food available and the surrounding water temperature influence development of the reproductive organs. If too little food is present, the scallop will direct all its energy toward survival and will not reproduce. 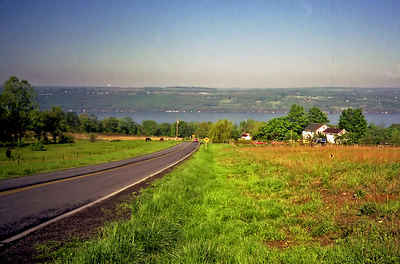 The law designating bay scallops as the official New York state shell is found in the New York State Consolidated Laws, STL, Article 6, Section 85.